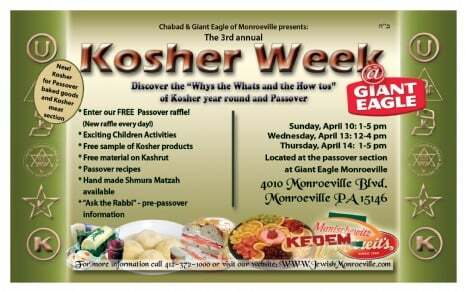 With the approach of the holiday of Passover we are happy to inform you that Chabad of Monroeville and Giant Eagle will be teaming up once again with displays, videos, recipes, delicious kosher treats, Passover information, traditional Shmura Matzah, a free raffle each day and much more at the Passover section at the Giant Eagle on Monroeville Blvd. 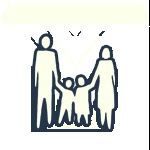 We will be at the store on Sunday, April 10 1-5pm,Wednesday 12-4pm and Thursday 1-5pm, (April 13-14) ready, willing and able to answer any questions that shoppers may have about kosher food, products and Passover. Stop by Giant eagle during those times and make your shopping experience more meaningful by learning the ins and outs of Kosher, or just stop by to say hello. In previous years hundreds of shoppers—Jews and non-Jews alike—learned the ins and outs of keeping kosher. They learned that kosher food is the fastest-growing segment of the food industry. And they learned that keeping kosher is far simpler than one might think. The “Kosher Week” event is part of Chabad's mission of promoting Jewish awareness.